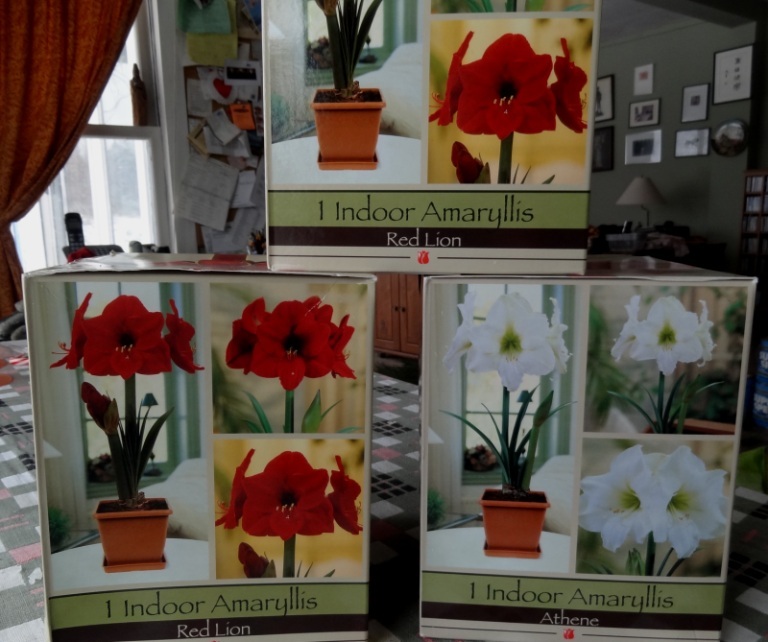 I suppose my amaryllis mystery began on December 11, 2014 when I rather belatedly bought boxed amaryllis bulbs ready for planting and blooming. 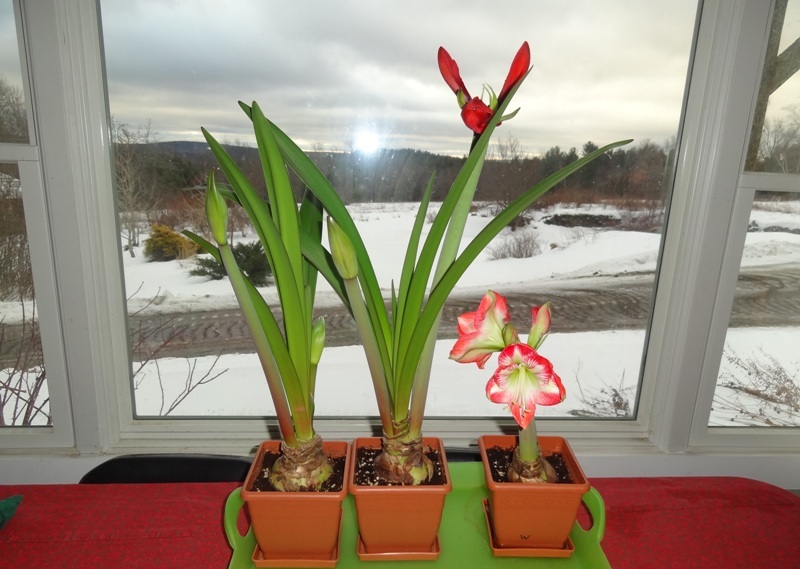 I knew they would not bloom in time for Christmas, but glamorous amaryllis flowers are welcome in January and February as well. I potted all three bulbs up as directed. I did notice that the Athene white amaryllis seemed to have been pruned back more severely or more recently than the other two. I kept all three bulbs together in our living space which is the warmest part of the house. As time passed the three bulbs showed various rates of growth, most especially Athene. If you look closely you can see that I marked her pot with a little W in expectation of a white flower. That bulb never produced any foliage but did send up two bud shoots, one of which began to open a couple of days ago. We will let the mis-labelling pass. 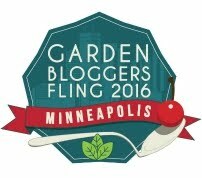 That has happened often enough in the garden, indoors and out. It is the rates of growth that amaze me. One bulb has produced two bud shoots with one blooming; one has produced foliage and two bud shoots, one of which is beginning to open; and the third produced foliage and two bud shoots of very different heights. Is there a solution to my amaryllis mystery? Is it just c’est la vie? or is there a reason? All three bulbs had exactly the same care and conditions, although we have to assume kind of difference in the striped bulb now blooming. Any ideas? Interesting! I think the little one is very cute. Your amaryllis have a lot more foliage than mine do. Mary – The little one is cute, and has NO foliage. The tall one with four buds is beginning to open . Lisa – Mystery or surprise. Almost the same thing. Rose – You are brave to even try to carry this kind of thing over to another season. Good luck next year. I’ve learned that each plant is an individual. (unless you buy genetically modified seeds – all clones one of another). I think the one that was to be white is very pretty, could be ‘Cinderella.’ With buds opening at different times you will be enjoying your blooms longer than if they opened all together. They are lovely, all three of them!